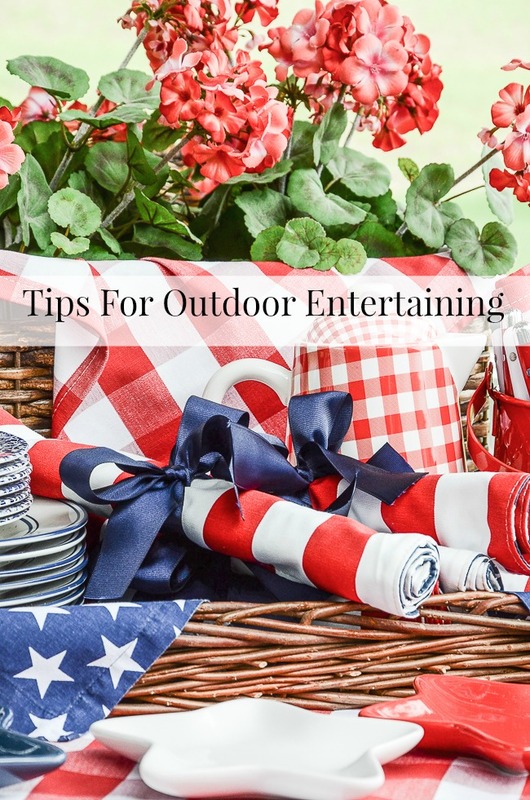 Entertaining outdoors is one of my favorite things about Spring, Summer, and Fall. But summer entertaining is what we do best, here at StoneGable! 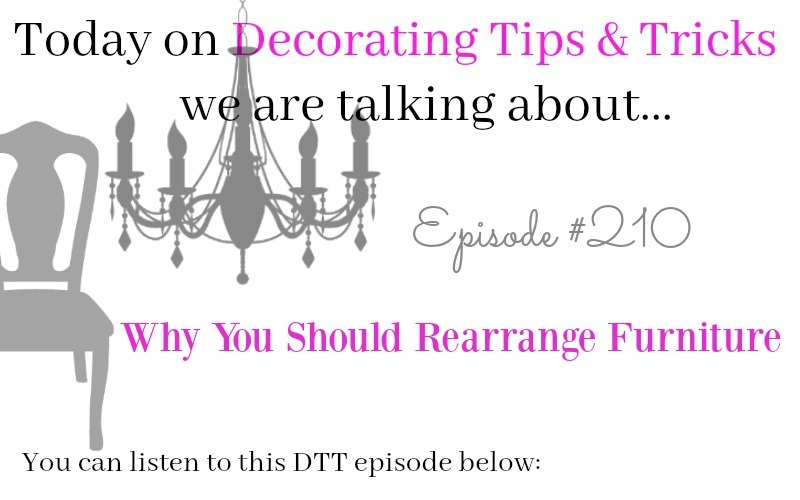 Today I want to share some tips that I always find helpful when having friends and family over. 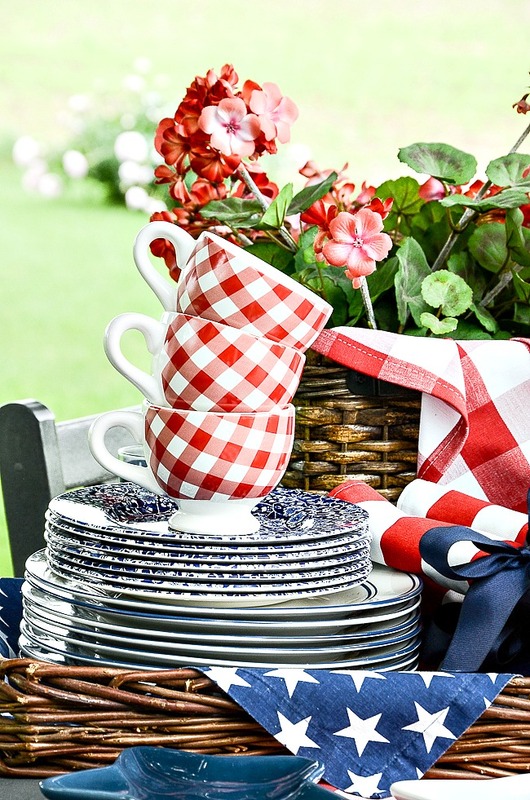 Outdoor entertaining doesn’t have to be difficult and a little preparation goes a long way! So go ahead… make is simple or extravagant… just get outdoors and party! 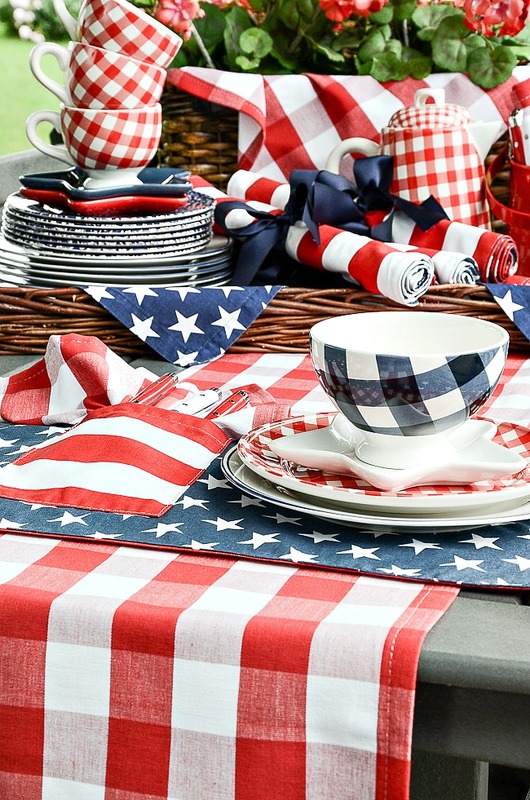 The napkins, placemats, and table runner are all part of the collection of red, white and blue products I’ve designed for the DTT shop. You can see them today HERE. And they are all on sale! If you haven’t been outside much, you may need to take a few minutes to clean up your space the day before you are planning to entertain. This isn’t the time to clean every single nook and cranny but hit the hot spots. Recycle or dispose of any trash or items that don’t need to be there. Sweep or use your blower to remove dirt, debris or pollen. I love my blower!!!!! Finally, I would hose off and wipe down outdoor furniture. Doing this a day early will give your cushions time to dry completely before your guests arrive. No matter what size your outdoor space is, you’ll want to create a few areas for specific things. 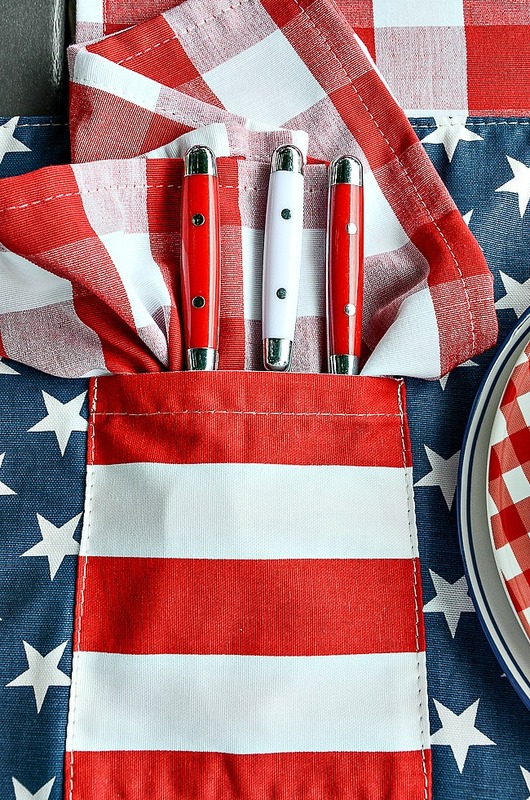 If you will be grilling, set aside space for your grill, grill accessories, and food prep station. Creating a space for a makeshift bar or beverage station comes in handy, as well. I like to have a space for sitting, a place for eating, and a place for serving food and drinks. A food and drink buffet can be really convenient when a sit down dinner isn’t necessary. We even have a zone for lawn games. The side of our home has been dubbed the “croquet lawn” and bocci takes over the back of our home and garden. Ladder ball and corn hole are near the patio. We love our games! The outdoor table is set up as a “pick up” station! Pick up your placemat, glasses, plates, etc! Easy-peasy! 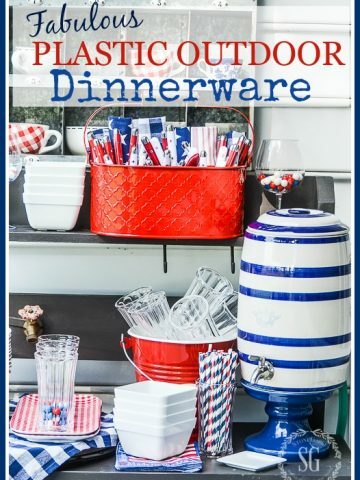 I’ve collected red, white and blue dishware and fabrics for years! If find something fabulous that goes with my theme and I collect it! After several years I had a plethora of items I love and they all go together! 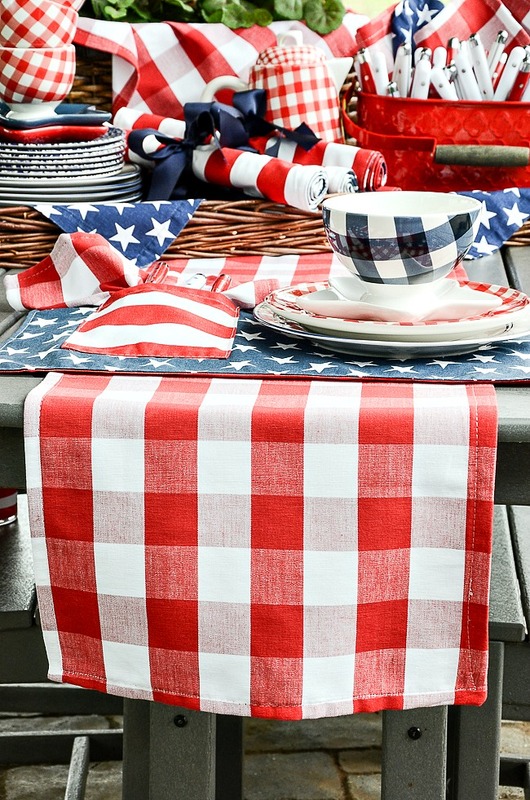 New to me this year are the red and white buffalo check and blue and white star napkins. I use them to line baskets and other things… and as napkins too! This is not the time to invest in an expensive outdoor landscape lighting. Instead, string lights across your space, nestle tiki torches, add a few decorative lanterns and candles. These things add so much ambiance to your space and are so welcoming. I love lighting the most because your guests will stay long after the sun sets for maximum catch up time! Lighting sets the mood! Bobby’s project this summer is to string lights across our patio! I can’t wait! 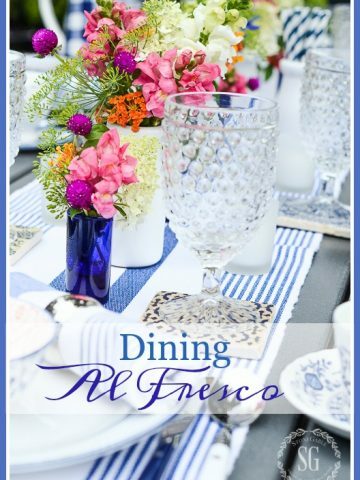 If you are the type who loves to decorate for each and every event, outdoor entertaining can be especially fun… and easy! Use potted plants to decorate your space, add a few fun throw pillows to your outdoor furniture and break out the candles. 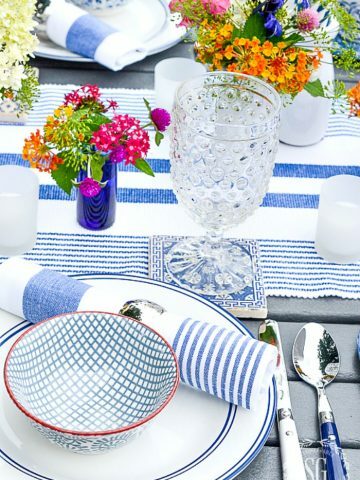 Table linens can also serve as beautiful decor. I even love to decorate with trays of appetizers and desserts. Food is beautiful after all! This year I am adding yellow to my collection to use with the black and white. I just got some beautiful white with yellow bamboo rimed dishes at HomeGoods. The red and white buffalo table runner adds a big punch of color to the table. All my new products are so well made! We like to say they are “boutique quality at very reasonable prices”! There is just something about music that brings people together. Choose songs for your crowd… relaxing music or upbeat depending on the taste of your guests. You can invest in a small speaker to play directly from your phone for a minimal cost. We love our portable bose player I got for Bobby for Fathers Day a few years back. We have a big patio and love to dance! This is the most important thing of all! A little work before your guests arrives will help you to enjoy your time as a party host. I like to prepare trays of appetizers like cut fruit and vegetables ahead of time. Simply set out the trays right before your guests arrive. Have drinks chilling in ice chests and beverage dispensers for ease and have your meal prepped as much as you can so you can visit with your guests instead of disappearing into the kitchen for most of the night. My favorite thing to do is to hire a couple high school girls who are responsible and “teach” them as they help me. I love passing on my decades of entertaining wisdom and the girls leave with a little cash in their pockets. And I have a tidy home after the party! If your area is known for being super hot, be sure to have a few fans around. Cool drinks also come in handy when trying to beat the heat. If the evenings get chilly, have a portable heater, fire pit or even a few throw blankets handy. Many of our parties start out as rather warm evenings but we end up around the firepit! At our last get-together, a friend brought his guitar and treated us to a concert around the firepit. We made ice cream sundaes and sang to the starlit sky. We had a blast! 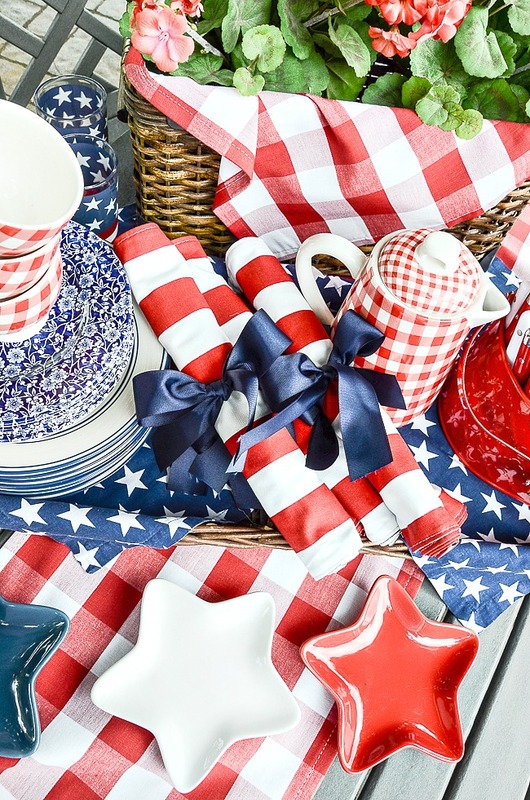 All my red, white and blue products in this post are on sale now. I also have some beautiful pillows for summer and they are on sale too. Come check them out HERE. You might like to follow me on Pinterest and see what I am finding to pin HERE. I love your blue and white floral dishes. Can you tell me where you purchased those? They are beautiful. I found them at HomeGoods. Hope this helps! 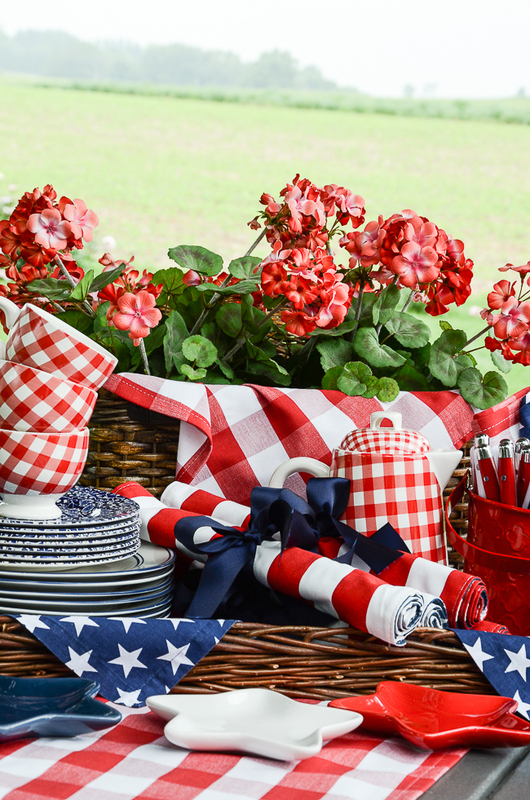 So festive, red, white and blue is always a classic and pairs great with the geraniums.Thanks for all the tips. I so enjoy reading your blog. You have great photographs and ideas. 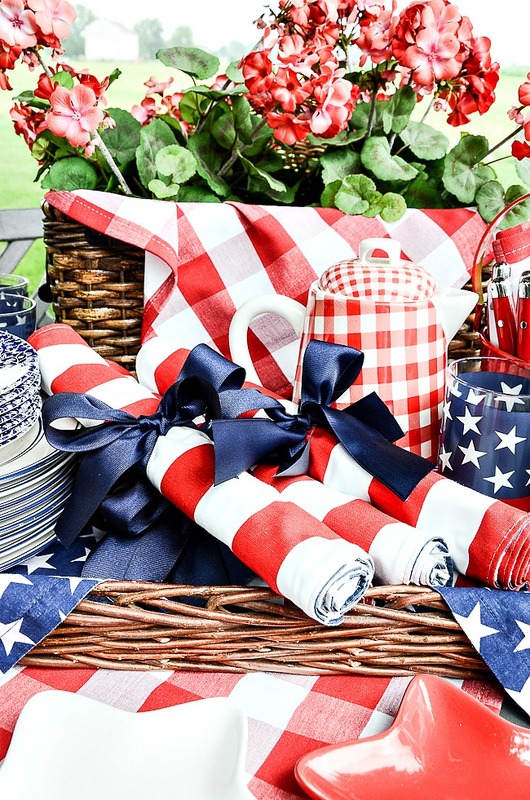 I love anything red, white and blue! 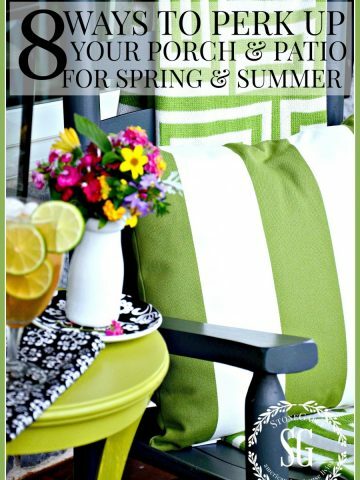 Great tips for outdoor entertaining! 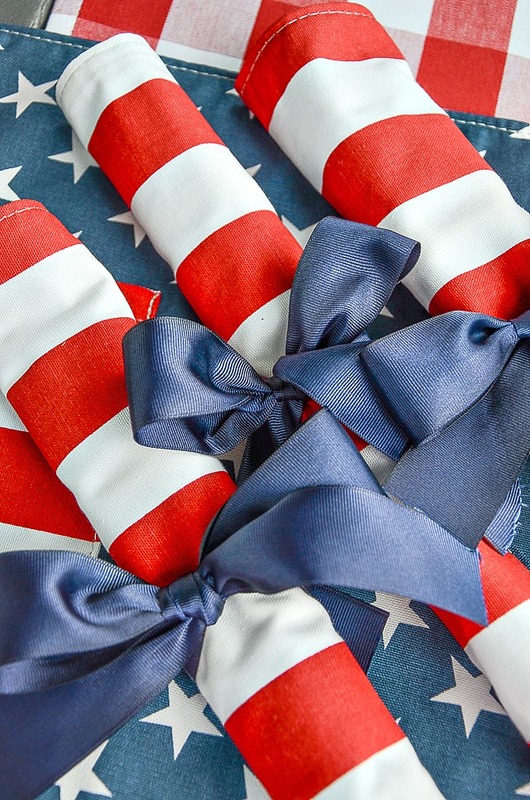 I love all of your red, white and blue! You have great ideas and I have enjoyed your blog for many years. I hope you will not be offended by this suggestion. Please stop using plastics as much as possible. They are so harmful to the environment and there are so many biodegradable ways to substitute. Best wishes for a wonderful summer. I am not offended at all. Be certain to include some solar lighting around your patio! It will brighten your evenings when you look out this winter as well. I have solar stars across the ceiling of our screen porch (also electric strings on the edges). During the winter we glance out and check the stars. HA! HA! We enjoy them and our neighbors across the way have commented as well. 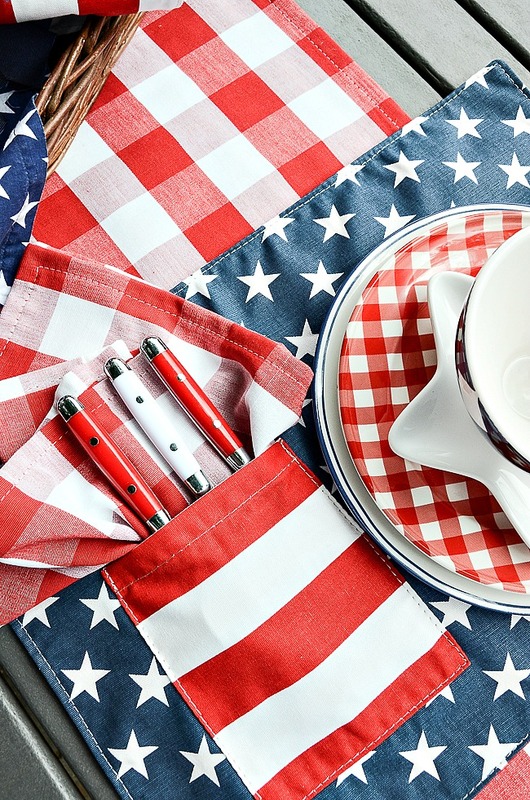 You can never go wrong with red, white! Great idea Nan! Thanks for the tip! Oh Yvonne!! You make entertaining so much fun and simple!! 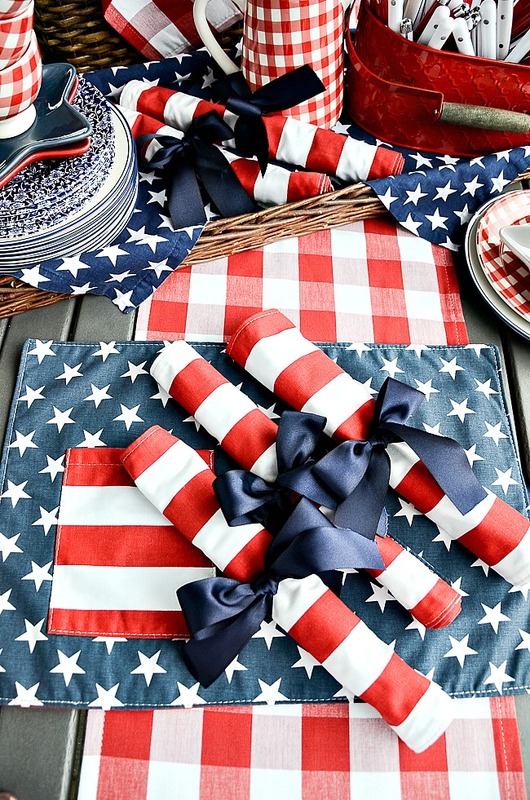 Love the red, white and blue and all the great ideas you share for entertaining!! I’d love to be your neighbor!! Right back at you, Karen!